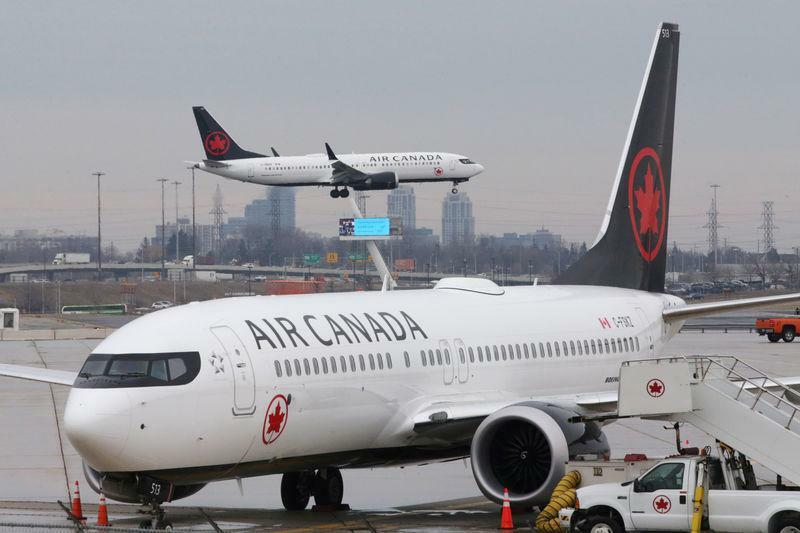 (Reuters) - Air Canada and United Airlines on Friday became the first major carriers in North America to warn of negative impacts on business due to the grounding of Boeing Co's 737 MAX planes. United Airlines, the No. 3 U.S. carrier, said it would see an adverse effect on its operations if the jets remained grounded heading into the peak summer travel season. Countries around the world, including the United States and Canada, banned Boeing's fast-selling 737 MAX this week after a fatal Ethiopian Airlines plane crash on Sunday, the second deadly disaster for the aircraft in five months. Shares of Air Canada fell as much as 3 percent in early trading in Toronto, but recovered later to close down 0.7 percent. Shares of United Continental Holdings Inc, the parent of United Airlines, were unchanged at $81.69 in U.S. after-hours trade. Airlines bought the 737 MAX for its longer range and fuel efficiency, and some carriers' business plans are facing disruption because of the grounding, which U.S. lawmakers have said could last for weeks at a minimum. The causes of Sunday's crash are still unknown. Air Canada, the country's largest carrier, has been renewing its narrowbody fleet with MAX aircraft to replace its existing Airbus A320 narrowbodies. It had expected to expand its fleet of 24 MAX jets to 36 by the end of 2019. The airline estimated that savings on fuel and maintenance costs would make the MAX 8 aircraft 11 percent cheaper to operate per available seat mile (CASM) than its existing Airbus A320s. CASM is a closely watched industry metric. Murray said he expected Air Canada to find a way to "mitigate" the impact of higher costs, and noted the company's forecast for annual profit margin remained in place for 2020 and 2021, suggesting this would be "a short term disruption." Southwest Airlines, the world's largest MAX operator with 34 jets, and American Airlines with 24 MAX in its fleet, both declined to comment on Friday. Canada's WestJet Airlines, which operates 13 of the jets, could not be immediately reached for comment.